I have been on a pizza kick for the past month. Our Friday night fish fry has turned into a call out your own pizza night, and I give credit to extremely easy pizza dough. I’ve said it before, but I love pizza, and everything about it. You can either toss a thin crust, medium crust, or heck even go deep dish, and the toppings can get at simple as sauce and basil with a bit of cheese, or heck, even something as creative as the feta and grape pizza. Our standard pizza has been a pepperoni, mushroom, and onion pizza, but personally I like loading one up with some hot Italian sausage, garlic, pepperoni, and black olives, even the occasional bell pepper tossed into the mix makes me happy. As I was making the pizzas, a thought came into my head. It could have been that I recently made the buffalo chicken mac and cheese pizza where mac and cheese was running through my mind, not sure, but I thought about making a mac and cheese that was loaded with everything I wanted in my pizza, hence the loaded pizza mac and cheese. Start by making the base for the mac and cheese. Cook your pasta, drain, and set it to the side. To a sauce pot add the butter and cook on medium heat until it is melted. Toss in the flour, and give a good stir using a wooden spoon of course. Continue cooking for a few minutes, stirring, and cook the flour out. Pour in the milk, and continue to stir until the sauce gets nice and thick. Add the noodles to a large mixing bowl, and add in the minced onion and garlic. Top with the tomato sauce, and cheeses, then pour the sauce over the top. Top with the olives, Italian sausage, and pepperoni. Use that wooden spoon and give a good stir to incorporate all of the ingredients. Pour this into a large casserole dish, and cover with aluminum foil. Place in the oven for 30 minutes, then when done, uncover and cook another 10 minutes. Remove from the oven and let sit for about 20 minutes to let things sit. Plating is easy. Get a nice scoop out of the dish and place on your plate. There is nothing fancy to the plating here, and you will note that at first bite you get that great aroma from what you would expect in a supreme pizza, but everything you wanted in a mac and cheese! Give this one a shot, and make it your own. 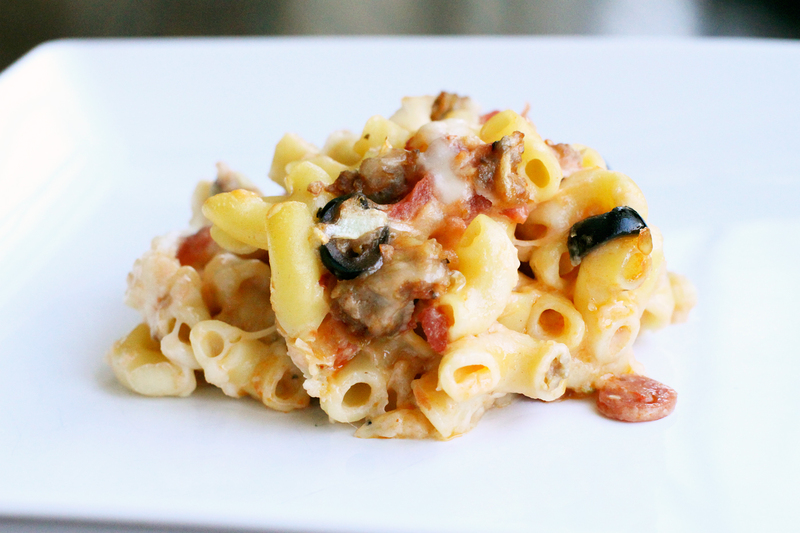 Take what you want in your pizza and make a mac and cheese out of it! Hope you enjoy.